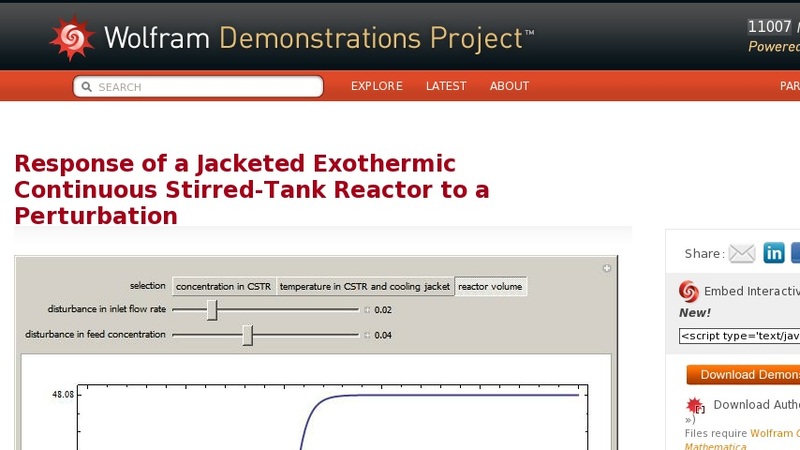 The governing equations for a jacketed exothermic continuous stirred-tank reactor (CSTR), where an exothermic first-order reaction is taking place, are given by: ... , ... , ... , ... . Here ... is the volume of the reactor; ... and ... are the inlet and outlet reactor flow rates, respectively; ... is the concentration inside the reactor and ... is the feed concentration to the reactor; ... and ... are the inlet temperatures to the reactor and cooling jacket, respectively; ... and ... are the temperatures in the jacket and reactor, respectively; ... is a heat transfer coefficient; ... is the area of the jacket available for heat exchange; ... is the flow rate of cooling water in the jacket; ... is the rate constant of the first-order reaction; ... is the heat of reaction; ... and ... are the densities of the reaction medium and the cooling liquid, respectively; ... and ... are the heat capacities of the reaction medium and the cooling liquid, respectively; and finally ... is the volume of the cooling jacket. In addition, one has the following relations: ... (Arrhenius's law with ... the activation energy and ... the pre-exponential term), ... (a controller manipulates the flow rate of the liquid leaving the tank in proportion to the volume of liquid in the tank), and ... (a controller manipulates the flow rate of water to the cooling jacket in proportion to the CSTR temperature). A step disturbance in the inlet flow rate or feed concentration is applied at ... . This Demonstration plots the concentration in the reactor versus time as well as the temperature in the CSTR (blue curve) and the cooling jacket (magenta curve). The volume of the liquid in the reactor can also be observed. All numerical values were taken from Luyben's book.